LAS VEGAS -- Camouflage has become a fashion statement to much of the world, but in the outdoors it not only has to be fashionable but also functional. All the latest and greatest in the camo world is here at the 2013 SHOT Show in Las Vegas. Companies are producing garments made out of the newest, lightest materials, developing new lines of clothes that keep hunters dryer, warmer, or cooler as the case may be, while still helping them blend into the background. 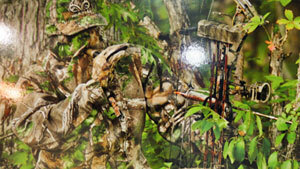 If you want to get a good idea of the best way to conceal in every possible situation, click image to look at these “Lucky 13” of the newest camouflage patterns available for 2013.